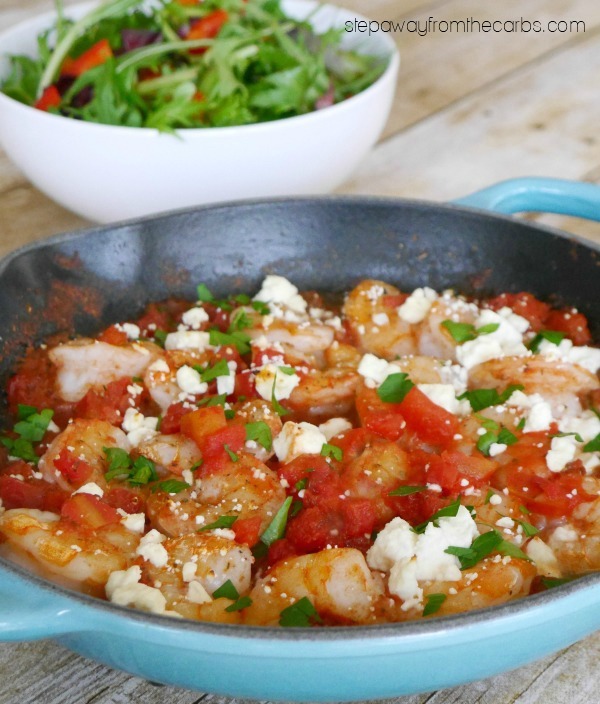 This Greek Shrimp dish is baked to Mediterranean perfection with tomatoes and feta. Low carb and keto recipe. The weather is all over the place at the moment, with snow, rain, wind, and even days of sun. I am *so* ready for spring! I find meal planning tricky at this time of year – I want to be out grilling at the weekends, but then we end up with cold rainy days and all I want is a lasagna. This dish somehow manages to be warming, comforting AND summery! It’s the Mediterranean vibe, I guess! The recipe uses half a can of diced tomatoes, which I know is annoying but I’m sure you’ll find a use for the other half (or double the recipe and use the whole can, LOL). But the carb count can really start to add up if you use the whole can for two servings, so don’t be tempted! 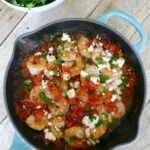 A cast iron skillet is perfect for this dish, and I love the bright color of this Le Creuset one! 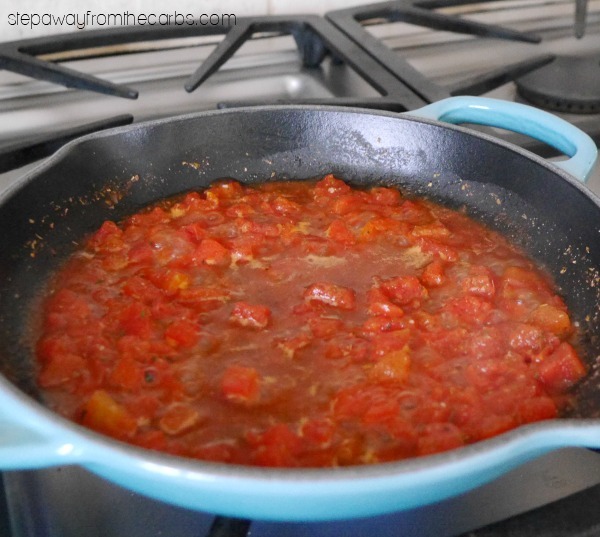 Add the tomatoes to the skillet, together with garlic paste, onion powder, dried oregano, salt and pepper. Sauté for about 5 minutes to allow some (but not all) of the liquid to reduce. Add peeled and de-veined shrimp, and stir well. 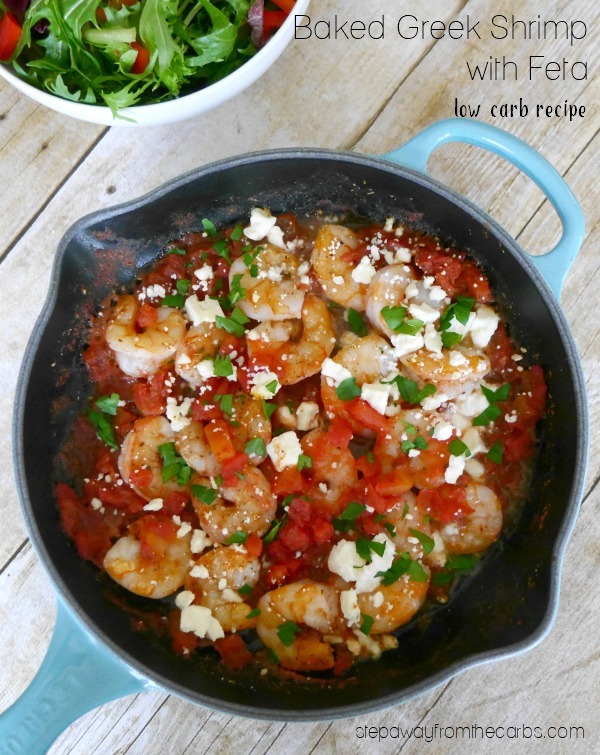 Sprinkle with crumbled feta, then place in a preheated oven for 10-15 minutes or until the shrimp has cooked through. Sprinkle with chopped fresh parsley, and serve! A simple salad is all you need to go alongside this tasty dish. Add the tomatoes, garlic paste, onion powder, dried oregano, salt and pepper to a cast iron skillet. Sauté for about 5 minutes to allow some (but not all) of the liquid to reduce. Add the shrimp, and stir well. Sprinkle with crumbled feta, then place in the oven for 10-15 minutes or until the shrimp has cooked through. Sprinkle with chopped fresh parsley, and serve!